Medical infusion pump is a new type of medical intelligent infusion products，due to the particularity of users and environments,its requirement of battery is very specific such as: battery input and output must be used the same port, so that the relevant personnel can operate in a safe and convenient way; battery charge and discharge must have the electric written instructions, and in order to observe constantly for patients and personnel, the battery indicator must be steady. In addition, battery safety and fire rating must meet special requirements of medical products. 1. 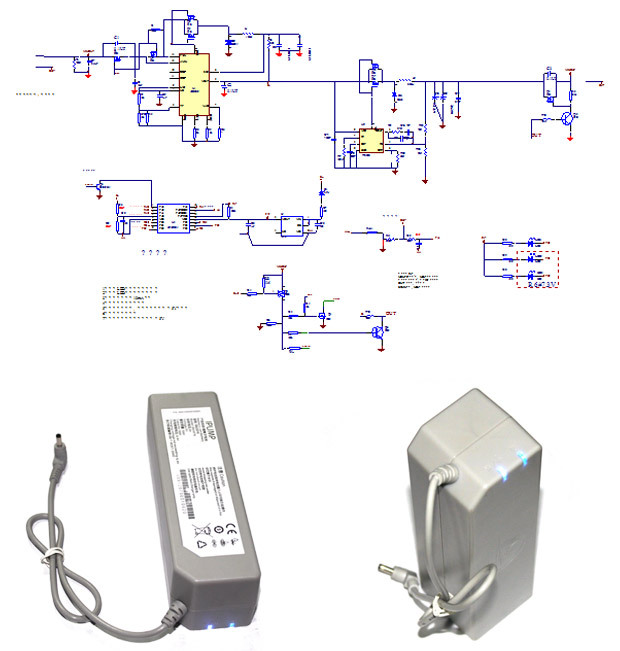 Lithium battery pack model design requirements:18650-2S4P / 10Ah/7.4V. 2. Input, Output characteristics: output, output using the same port, depending on the special medical requirements, medical infusion pump can switch function automatically. the output characteristics:In the condition of discharging, Output port of DC wire of battery will output automatically characteristics of 5V/2A. the input characteristics:Plug 9V/2A adapter in DC output line, the battery is automatically charged. status characteristics: No output status in charging of 9V/2A; it will automatically switches to output status of 5V/2.5A when 9V/2A was removed. 3. Charge and discharge instructions:A monochromatic light and a bicolor light indicate high / medium / low grades of battery capacity. 4. Discharge status:When the red light is off, but also to support the discharge about 10-20 minutes. finished battery with a short circuit, reverse charge protection. Intelligent step-up/down module circuit: mainly used to converse the input date of 9V/2A to DC, then make DC be fit into CC / CV charging mode of two strings of lithium batteries, and step-down two strings of lithium batteries to regulated output status of 5V/2A. Protection Board (PCM): designed for rechargeable lithium batteries to protect circuit, the protection board needs to provide smart power calculation, overcharge, over discharge, short circuit, over current protection to avoid the hazard of burning and explosion because of its chemical properties. Protection IC (Protection IC): The main function of this design is to protect chip, it aims to detect the batteries’ overcharge, over discharge, over current, short circuit, so that the batteries working in a safe, stable and efficient condition. Temperature switch: mainly for temperature protection design. When the temperature of the battery reach to 70±5℃due to other usual problems, the temperature switch will achieve to over-temperature protection, when the temperature drops, automatic recovery. MOSFET：MOSFET acting as a switch in the protection circuit, and balances the voltage across the load. DC output line: lithium battery state of input and output of the pump infusion. battery case: meet the medical products such as fire group, a model of whole cell.